* Prices & specs are subject to change without notice. 7255BN size from 8 to 10/0 black nickle - Eye turned-up. 7829BN size from 2 to 6/0 black nickle - Beak hook. 7988BN size from 4 to 5/0 black nickle - Livebait hook. 7918BN size from 6 to 4/0 black nickle - Circle hook. 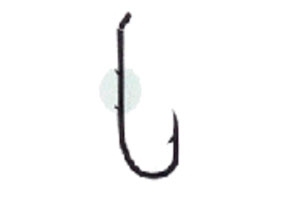 7168BN size from 4 to 3/0 black nickle - Baitholder hook. 7930BN size from 8 to 3/0 black nickle - O'shaughnessy Long Shank, forged 2x. 7255SS size from 8 to 10/0 standard steel - Eye turned-up. 7930SS size from 8 to 10/0 standard steel - O'shaughnessy Long Shank. 7920SS size from 8 to 10/0 standard steel - O'shaughnessy Short Shank. All copyrighted materials and photos published on this website are provided with permission from the respective owners and is solely used for the purpose of this website. Any unauthorized copying, publication, reproduction or distribution of copyrighted works is an infringement of the copyright owners' rights and is therefore prohibited.